ICE Vote Seeks To Divide Democrats Democrats denounced the nonbinding House Republican resolution backing the U.S. Immigration and Customs Enforcement agency as a "stunt" and many voted "present" to avoid taking a position. 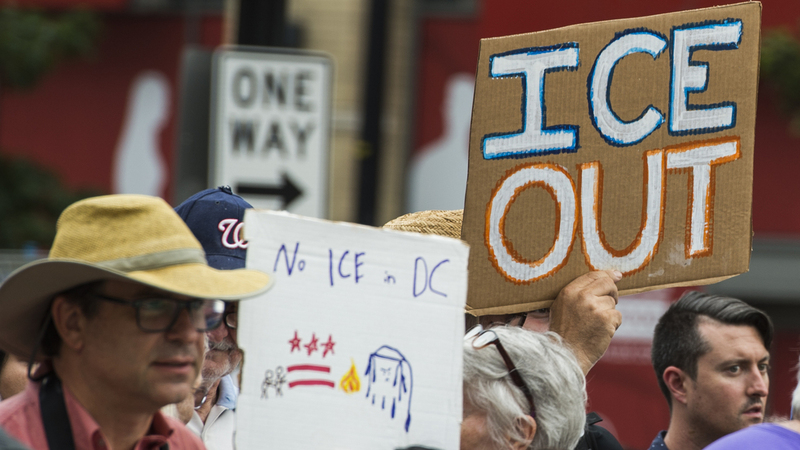 People hold up signs July 16 in Washington, D.C., as they protest ICE. Getting rid of the agency has become a popular rallying cry among progressives, but the House on Wednesday overwhelmingly passed a symbolic measure voicing support for ICE. House Republicans claimed a political victory Wednesday after the House voted 244-35 in favor of officially supporting the U.S. Immigration and Customs Enforcement agency, a vote intended to force Democrats to take a position amid calls from progressives to abolish the agency. But Democrats largely avoided taking any position at all. Instead, they tried to refocus the immigration debate away from ICE and toward the ongoing controversy over President Trump's policies for handling asylum claims and the separation of families at the southern U.S. border. The split is the latest evidence that immigration has become one of the biggest and most intensely partisan issues of the 2018 midterm elections. Republicans were clear from the start that they wanted to vote on the nonbinding resolution to support ICE as a political exercise. Republicans want to demonstrate that all Democrats are being pushed to the left by progressives, like Sens. Elizabeth Warren, D-Mass., and Kamala Harris, D-Calif., on ICE. Republicans named Harris and Warren during debate on the floor. Warren has said ICE should be replaced with "something that reflects our morality and that works." Harris has said ICE needs to be examined and lawmakers should "probably think about starting from scratch." Republican leaders, like Majority Whip Steve Scalise, R-La., wanted House Democrats to publicly state their views on the agency so they could emphasize the split to voters in the fall. "I think it shows an important contrast in this country about what's at stake in this November election," Scalise said. "We stand up for our ICE agents and the people that are keeping America safe. They want to get rid of them." Scalise and other GOP leaders point to recent polls that found that a majority of likely voters, including Democrats, oppose abolishing the agency. But Democrats said Wednesday they weren't going to take the bait. "We do not have the time to waste with political stunts like this bill," said New York Democratic Rep. Jerry Nadler. "While the moral fiber of our country is torn apart." Nadler, and 132 other Democrats, voted present on the bill, a move that allowed them to avoid taking sides. Republicans, including President Trump, said the vote proved that Democrats would rather have open borders and zero immigration enforcement than support ICE and its agents. Trump has said repeatedly that he wants to keep fighting with Democrats over immigration. Last month at a rally in Nashville, Trump said open borders were part of their political strategy. "The Democrats want to use it as a campaign issue, and I keep saying I hope they do," Trump said. "That's a good issue for us, not for them." But Democrats disagree. They think their voters are just as motivated by immigration as the most fervent members of Trump's base. Progressive Democrat Rep. Pramila Jayapal, of Washington, said she's happy to keep debating Republicans over immigration. "We know we win on family separation and we know we win on immigration in general," Jayapal said. "I think his divisive tactics play to his core base who are going to be with him on anything ... but the majority of people do want checks and balances on this president."